[Neponset, IL] -- A global leader in bulk material handling technologies has concluded a month-long program promoting October as National Breast Cancer Awareness Month. 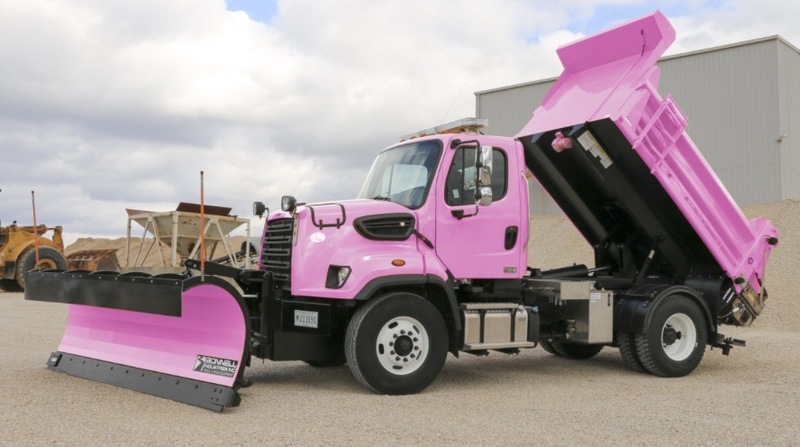 The company manufactured a special series of its Cougar® brand DC truck vibrators in the traditional pink color, and donated $50 to the Susan G. Komen Foundation for each one of the limited edition units sold throughout the month -- a total of $3,750. Breast cancer is the second most common type of cancer in women, and data shows that about 1 in 8 women born today in the United States will get the disease at some point. The good news is that many women can survive the disease if it’s found and treated early. Regular mammograms remain the fundamental screening test, helping to promote early detection and treatment, when intervention is most effective. Since 1982, the Susan G. Komen foundation has played a critical role in virtually every major advance in the fight against breast cancer – transforming how the world talks about and treats the disease and helping millions of breast cancer patients become cancer survivors. Now the world’s largest nonprofit source of funding for the fight against breast cancer, it is the only organization that addresses the disease on multiple fronts such as groundbreaking research, community health, global outreach and public policy initiatives in order to deliver the greatest impact. To date, the organization has invested more than $2.9 billion in developing research, treatment options, community outreach, advocacy and other programs in more than 60 countries. Those efforts have helped reduce deaths from breast cancer by 38 percent between 1989-2014. Martin Engineering is a global innovator in the bulk material handling industry, developing new solutions to common problems and participating in industry organizations to improve safety and productivity. The company’s series of Foundations books is an internationally-recognized resource for safety, maintenance and operations training—with an estimated 10,000 copies in circulation around the world—and employees take an active part in ASME, SME, VDI, CMA and CEMA. The firm also played a pivotal role in writing and producing the 7th edition of the CEMA reference book, Belt Conveyors for Bulk Materials. Martin Engineering products, sales, service and training are available from factory-owned business units in Australia, Brazil, China, France, Germany, India, Indonesia, Italy, Mexico, Peru, Russia, Spain, South Africa, Turkey and the UK.